This popular trail resides within the boundaries of Gold Rush Park and loops from the Marshall Monument, over the shoulder of Monroe Mountain, along a ridge, and back down to the area of the west parking lot. A $5 park fee is required if you park within the state park; cheapskates like me, park north of the park boundary (near the flashing yellow light). The state park allows dogs on leashes, except on trails, I found this out the hard way! Directions: Take Highway 49 north from Placerville towards Coloma and find a place to park either in our outside the park. The trail is best enjoyed by starting from the Bedrock Mortars site, near the cedar teepee, on the west side of the highway. This is signed as the Monument Trail and it takes you to the James Marshall Monument (you could also drive and park there if you prefer). 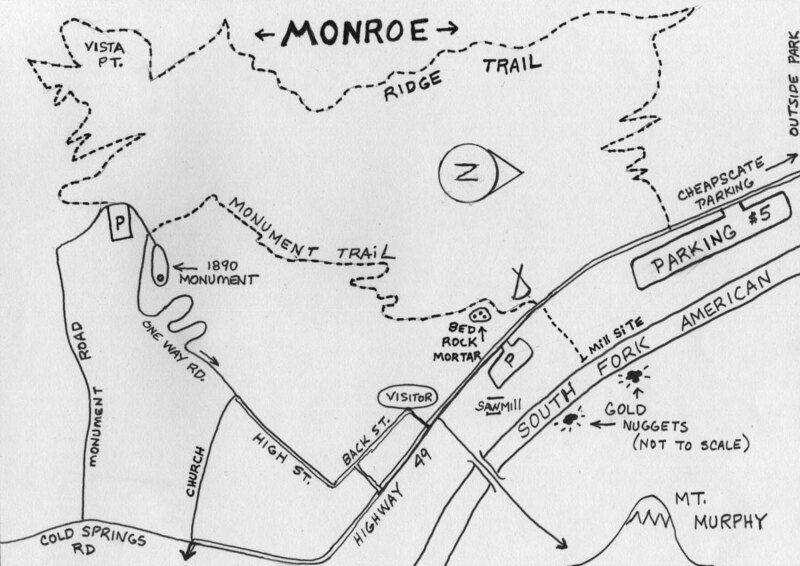 Then locate the Monroe trailhead back along the access road across from the parking lot. The easy to follow trail switchbacks gently up to near the top of the mountain following a ridge before heading down to Highway 49 near the Monroe Orchard. The trail offers great views of the Lotus-Coloma areas with Mt. Murphy to the east where a cannon once announced the daily mail stage from Placerville to the Argonauts working the river for gold. Of note are the alien trees found near the monument picnic area. Notice the cypress trees and other non-native “guest” trees planted long ago. You might expect the perpetrator of the gold rush, James Marshall, to have a gold statue or at least a gold plated statue? What? No? In fact he didn’t even get a real Bronze statue, but a “statuary bronze” statue made of Lead, Tin, and Zinc, painted bronze! There’s also a short trail, unsigned, that leaves from the left of the restrooms, near the picnic area of the monument, and takes you downhill to the Catholic cemetery and the Marshall cabin. The cabin is amazingly preserved in its original condition. The quarter mile side-trip is worth the effort.